Salah, the English Premier League's top scorer with 13 goals, also scored 10 times in all competitions for Serie A club AS Roma in 2017 before making the move to Merseyside. Egypt star Mohamed Salah won the prestigious BBC African Player of the Year award on Monday, rewarded for a 2017 packed with sparkling displays for Liverpool, AS Roma and his national team. The 25-year-old topped a poll that saw a record number of votes cast after firing Egypt to the final of the Africa Cup of Nations and almost single-handedly taking Egypt to its first World Cup finals since 1990, scoring five and setting up its other two goals in qualifying. Salah, the English Premier League's top scorer with 13 goals, also scored 10 times in all competitions for Serie A club Roma in 2017 before making the move to Merseyside. "I am very happy to win this award," Salah told BBC Sport. Salah beat a star-studded cast of rivals to become the third Egyptian to win the award and first since Mohamed Aboutrika picked up the gong in 2008. Gabon's Borussia Dortmund striker Pierre-Emerick Aubameyang, Guinean Naby Keita — his future Liverpool teammate currently at RB Leipzig — fellow Reds star Sadio Mane of Senegal and Chelsea's Nigerian winger Victor Moses lost out to the pacy attacker, nicknamed the "Egyptian Messi". "I want to be the best Egyptian ever so I work hard," added Salah, whose 15 goals helped Roma to its best ever points total of 87 as it finished second in Serie A last season. Salah joins African legends such as Ivorian duo Didier Drogba and Yaya Toure — the latter won it twice — as well as Liberian striker George Weah in winning the award. 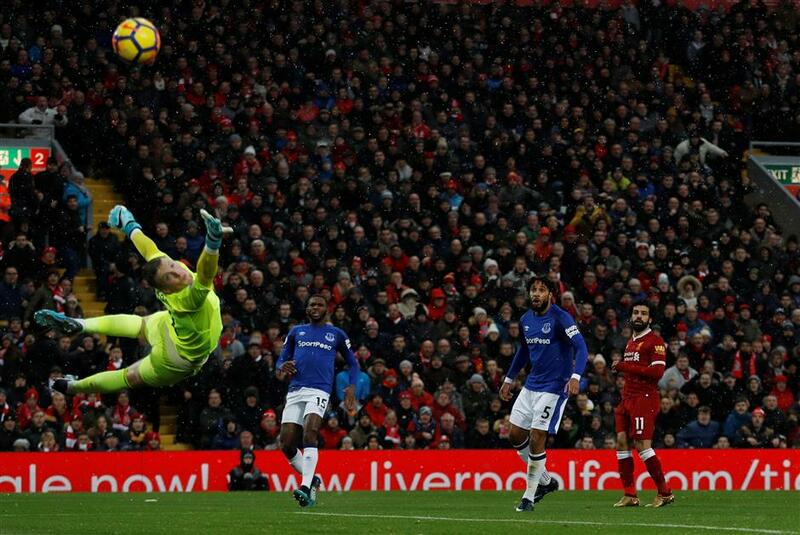 Liverpool's Mohamed Salah (right) scores the team's first goal past Everton goalkeeper Jordan Pickford during their English Premier League match at Anfield, Liverpool, on December 10, 2017.